This "Best in Class" Countertop Home Water Distiller comes with a High Quality Four Litre Glass Carafe with Ergonomic "Easy-Lift" Handle. 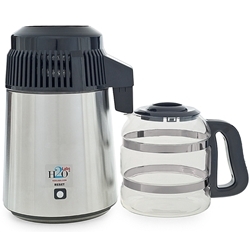 It is a very dependable water distiller with a Stainless Steel main body exterior and a High Quality 100% Stainless Steel interior steam chamber and condensing coil; and also features single-button start, automatically turns off, and is very easy to clean. Our "Best in Class" Models 100E, 100SSE, 300E and 300SSE are identical except for your choice of exterior, White Baked-Enamel metal or Stainless Steel; and the Collection/Serving pitcher, (carafe), which is Break-Resistant Food-Grade BPA-Free Polypropylene with the Model 100E and 100SSE; or a specially designed Glass Carafe and porcelain nozzle insert with the Model 300E and 300SSE. Other than those variations, Models 100E, 100SSE, 300E and 300SSE all share the same top quality features of our tried and true system that has been sold to thousands of satisfied customers. Innovative Porcelain Nozzle Insert so pure water doesn’t touch plastic. Optimal size 565 Watt heating element. Bigger is NOT better. Larger heating elements in four litre units can cause water to mix with VOCs and other contaminates. Some manufacturers use a “splash shield” with a larger heating element which is ineffective in preventing contamination. Collection Container: 4 Litre capacity, top quality glass carafe.